We're shorter than most things in our world, natural or manmade. So while it's pretty common to look up, rarely are we looking down. 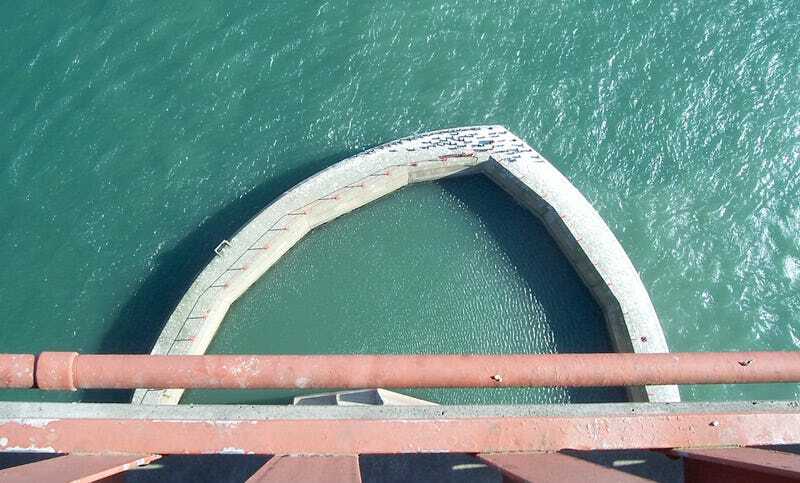 For this week's Shooting Challenge, you're looking down—straight down. Take a photo from directly above your subject, approaching it at a perfect 90-degree angle. Give us an almost clinical view of anything from above - it can be from the air or just a few feet off the ground - but the perspective's angle should be fixed. It's not easy to be directly over your subject. Unless your a tightrope walker, climbing a building alone can't generate a perfect photograph, unless you want the building in the shot. Your first response will be to cheat, maybe to tilt your camera 80 degrees and get close to the idea. But really push yourself for the god-like floating view. Consider bridges and sticking your camera out a few feet from yourself...maybe affixed to a rod and set on a timer. Our lead photo is from Kevin on flickr. At first, it's your run-of-the-mill shot down the side of a bridge. But because it's against the water, and because of the nature of the pier...it almost feels like you're standing on the ground viewing a wall, no? The perspective becomes something entirely new. Send your best photo by Monday, June 27th at 8AM Eastern to contests@gizmodo.com with "Above" in the subject line. Save your files as JPGs, and use a FirstnameLastnameAbove.jpg (970px wide) and FirstnameLastnameAboveWallpaper.jpg (2560px wide) naming conventions. Include your shooting summary (camera, lens, ISO, etc) in the body of the email along with a story of the shot in a few sentences. And don't skip this story part because it's often the most enjoyable part for us all beyond the shot itself!